Partially-bound volume of 137 issues of The Daily Cleveland Herald, each issue is 4pp., July 1 through December 30, 1860. 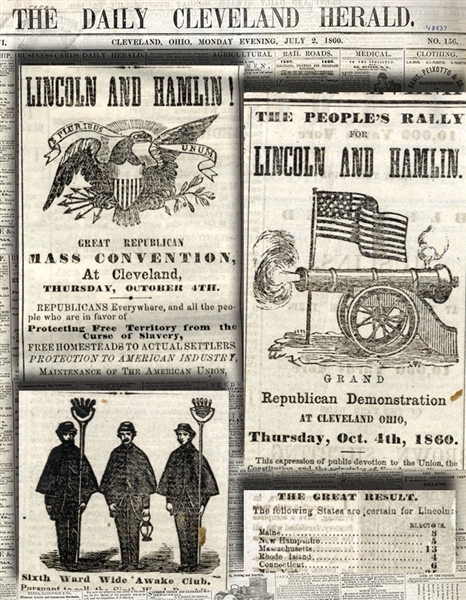 These issues leading up to the election of Abraham Lincoln and his vice president, Hannibal Hamlin, carry almost-daily endorsement ads for the Lincoln-Hamlin ticket. As the issues reach election day, you’ll find many illustrated ads for the Cleveland Lincoln WIDE-AWAKE meetings and mass rallies, as well as the Republican Convention. The national ticket is also printed almost daily in the pre-election days. The election day issue is missing, otherwise the papers are all there, although the cover boards are loose. Dec. 4 carries “Synopsis of the President’s Message on the Anti-Slavery Movement.” Near the end of the year are seven full columns devoted to the message on the state of the union by outgoing president James Buchanan. Also, post-election and end of year issues devoted to the boiling issue of secession and the last issue of the year carries a graphic of ther Forts In Charleston Harbor, a foreboding of the Fort Sumter bombardment in the coming spring. Headlines from this volume include: “Election Returns by Mail,” background on “The President-Elect,” “From :incoln’s Home,” “Lincoln’s Majority,” “A Republican Demonstration - Speech of Mr. Lincoln,” “Meeting of Lincoln and Hamlin,” “Visit of the Vice-President” to Cleveland, “Threats to Prevent the Inauguration of Lincoln.” Of the 137 issues, we estimate at least 100 (likely more) will have some mention of Lincoln’s name through endorsement or news coverage or news related to the election.